The composer’s image – in his time, he was an avowed anti-Semite – repeatedly sparked fierce discussions in the feature pages of national and international newspapers. Art, music, and especially the musicians in National Socialist Germany became the direct focus of new analyses and current evaluations. Although we may not forget and certainly should not suppress the political context, if we approach the actual work, a prosaic analysis reveals that the word “German” does not appear once in the entire opus, and that Pfitzner took the emotionally charged title of a folk song collection “Aus deutscher Seele” from the German-Jewish author Ludwig Jacobowski. 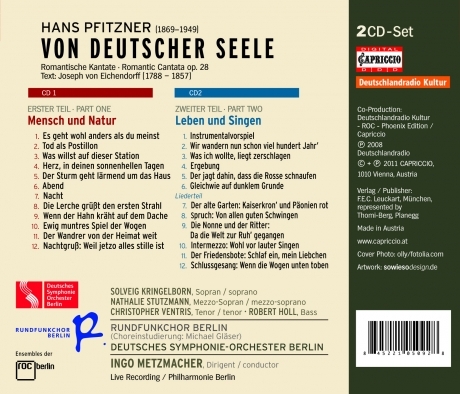 The Eichendorff cantata “Von deutscher Seele” was composed in 1921 and – this is also one of the contradictions – is not ideology set to music, but abstains from any kind of resentment. The work is subtitled “ a romantic cantata”. Pfitzner’s tonal language was certainly rooted in the 19th century, but it by all means branches out onto “new pathways”, to paraphrase Robert Schumann, whom Pfitzner greatly admired. 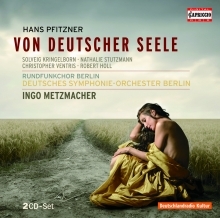 INGO METZMACHER had the support of a first-class ensemble of soloists for his Berlin performances. Despite all polemic and widely varying discourses: the aim of this CD release is to document the opus itself in its entirety, regardless of how discussions of it may continue.